If you're looking for a striking piece of art to impress then look no further! The lighting on this photograph was beautiful, it reminded me of 17th century portraits by the greats. 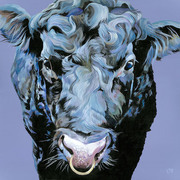 I wanted to play on this stylisation further, so think of Lizzie as the 21st century, 'Girl With The Pearl Earring' of the cow world! The background of this image is one of the really special things about the painting. With a mottled backdrop of deep teals, indigos, and greens this painting has a textured sea of colour bringing it to life. But let's not forget the best bit! Lizzie herself. She's a wonderfully classic ginger Highland Cow with a regal glossy coat, but that cheeky nose lick and glint in her eye reminds us why we all love cows so much. Their natural humour and heart warming character. She's really a thing of charm and beauty.